Must Try: With the greenmarket being a morning type of affair, what better breakfast food is there then freshly fried donuts? 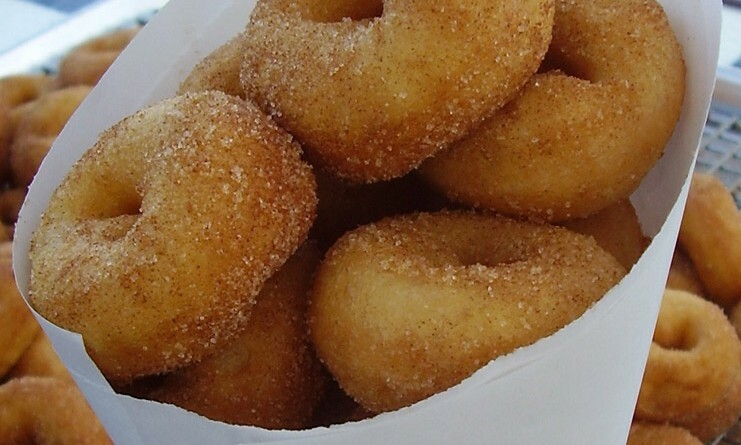 Our go-to green market bite is none other than Cider Doughnuts. The brainchild of chef John Carlino, who wanted to bring a piece of his childhood in Connecticut to Palm Beach, the delicious apple cider doughnuts, dusted in cinnamon and sugar, come from a recipe that is three generations old. Made on-site with apple cider, flash fried, and served warm in a paper cone, they are best paired with the caramel dipping sauce. Double down on the breakfast morning staple with a fresh cup of joe from Rabbit Coffee Roasting Co. Roasting micro-lot, seasonal coffee beans, Rabbit’s coffee selections are some of the best in town—the micro-lot sourcing not only ensures the beans are of the highest quality, but also that they are limited runs, so sip while you can. If an adult beverage is more you style, the $10 bottomless mimosa bar will once again serve the bubbly citrus sip. Enjoy a tipple or two while listening to live tunes or catching one of the monthly chef demonstrations (opening day, October 3, and then the second Saturday of each month). Green Offerings: The WPB GreenMarket has one of the most impressive lists of growers of all fresh markets in town, including: Kai Kai Farms (seasonal produce, fruit, and herbs), Farmhouse Tomatoes (heirloom tomatoes), Farriss Farm (dairy, meat, poultry, and seafood), Swank Specialty Produce (hydropinically-grown produce and herbs, hard-to-find specialty greens), Ms. V’s Organics (organically grown veggies and herbs), to name just a few. As for prepared goodies (baked goods, pasta, coffee, pastries, cheeses, pickles, jerky, and more), ornamental plants (orchids, flowers, herbs and citrus trees), and home and personal accessories (soaps, pottery, incense and perfumes, and more), the list of vendors is simply too numerous to go through name by name. lets just say there is something for everyone, regardless of what the shopping list may include. Tips for the Shopper: Downtown West Palm Beach has plenty of parking for those looking to make the trek; click here for a detailed map of parking locations. If you’re not in a hurry to get the weekly produce shopping in the books, park a little ways off the beaten path – the parking garage at the 500 block of Clemtatis allows for a leisurely stroll to the waterfront, while the trolley will make the trek back a breeze, especially with those eco-bags stuffed with goodies. Join the fun by boat and tie-up at the City Docks directly across Flagler Drive. Just don’t bring any bananas back on board!